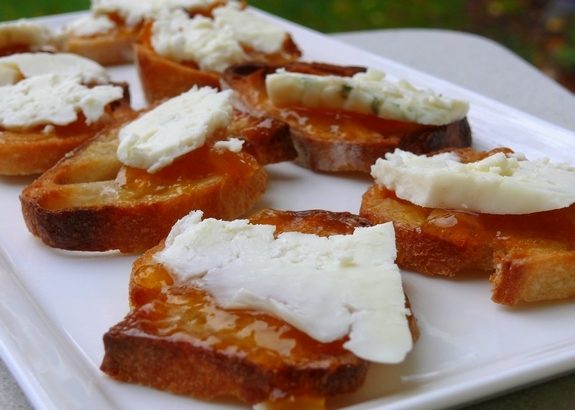 Here is another quick crostini idea for the upcoming holidays. I originally saw this using fig chutney, but I happened to have peach chutney in the cupboard, so I went with that. The verdict…excellent! This is a fabulous pre-dinner bite because it takes nothing, time and cooking wise, to put together. You really want to use a high quality, pungent blue cheese here, otherwise the sweetness of the chutney will overcome the flavor of the blue cheese. Use any flavor of chutney you like or can find, peach, fig, mango….all will be delicious and balance nicely with the cheese. This is also a great dish for anyone who feels they are lacking in cooking skills but still wants to contribute to the party. If you can slice a baguette, you can make this. It will be a wonderful and classy addition to any parties you are attending this season. Also perfect for the party-giver who has so many other complicated dishes to prepare but still needs appetizers for arriving guests. Heat oven to 400 degrees F. Place bread slices on a baking sheet and brush both sides of the bread with oil. Bake until golden brown, 4 to 5 minutes per side (this can be made up to two days ahead and kept in an airtight container). Dividing evenly, spread 3/4 cup chutney on crostini. Top each slice with thinly sliced blue cheese. Oh I bet this is yummy. Perfect for me as I need some quick apps that don;t require my time while I concentrate on the turkey! I love anything with blue cheese!! Oh how quick and easy and full of flavor…thanks for all the easy ideas!! I am so making this as my Thanksgiving appie! Is it okay to eat just these with a bottle of your wine for dinner? 😉 YUM! mmmm fruits and cheese are my favorite combo!